The EU’s autonomous trade preferences for Ukraine have been in existence for almost a year: since April 23, 2014. What has changed in the Ukrainian export structure since then? At first glance, no dramatic changes are apparent. According to data from DerzhStat, Ukrainian exports grew only by 2.6% on the results of 2014. These are very poor figures, because in mid-2014, exports were expected to grow by over 15%. This low growth can be explained by the general slowdown of the Ukrainian economy, primarily due to the conflict situation in the eastern part of the country. But there is another problem. Ukrainian producers failed to meet most quotas for duty-free exports to the EU last year. Moreover, in many areas there were no exports at all. Does this mean that hopes for the European market were unfounded? 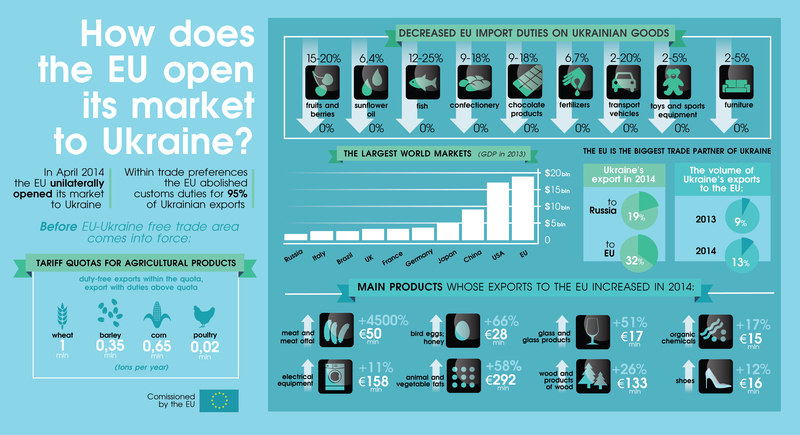 The infographic prepared by the EU-Ukraine Cooperation News denies such conclusions. Here are groups of products that contributed the most to export growth to the EU in 2014. These exports are faced with neither political risks, nor unstable exchange rates. As a result, one can expect significant growth in exports this year for these groups of products. The infographic also highlights groups of products that have the most to gain from the removal of import duties. These groups can be seen as the potential leaders of Ukrainian exports to the European Union. The article was provided by Evropeiska Pravda.